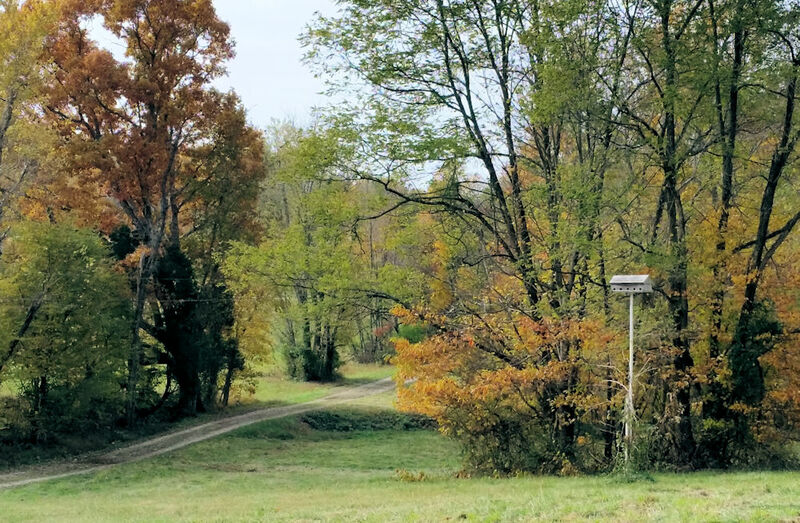 Most people think of autumn as the time to slow down, but here in the country, we have work to do before we can take it easy. We’ve had a couple of hard frosts but the weather has actually been pretty balmy in the 50s and 60s. This really helps extend the growing season here in southern Indiana. Fall view in the country, looking down to the creek. One of my favorite things to do is look for the hardy flowers that are still blooming, even after the frost. 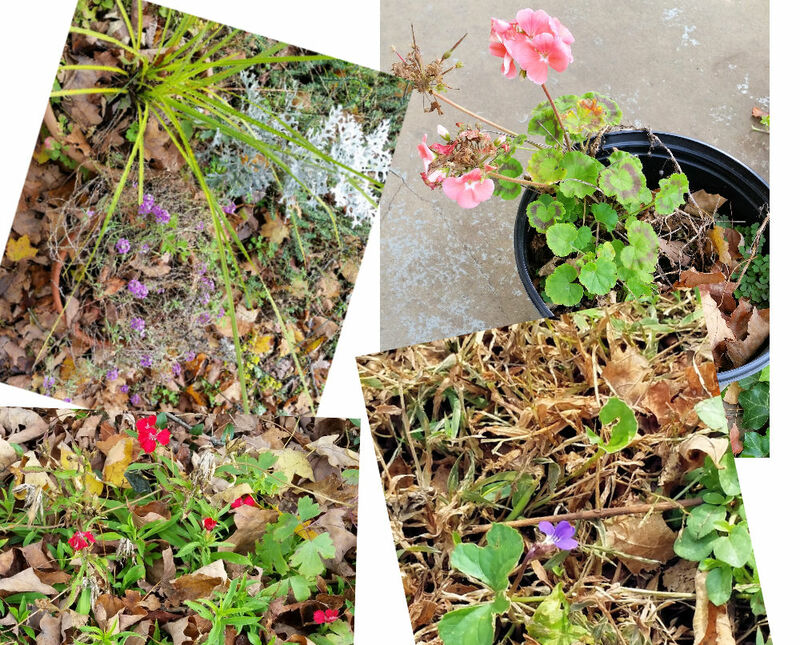 I still have some geraniums, alyssum, Sweet William, and even one tiny confused violet. There is almost always some flower which manages to make an appearance except in deepest winter. Hardy flowers that survived a hard frost. Alyssum, geranium, sweet William and a tiny violet. We also like to plant a fall garden. As you can see by the photos, the frost killed the weeds but the kale is still happily growing. The cold frame will protect some more kale and lettuce until probably early December. 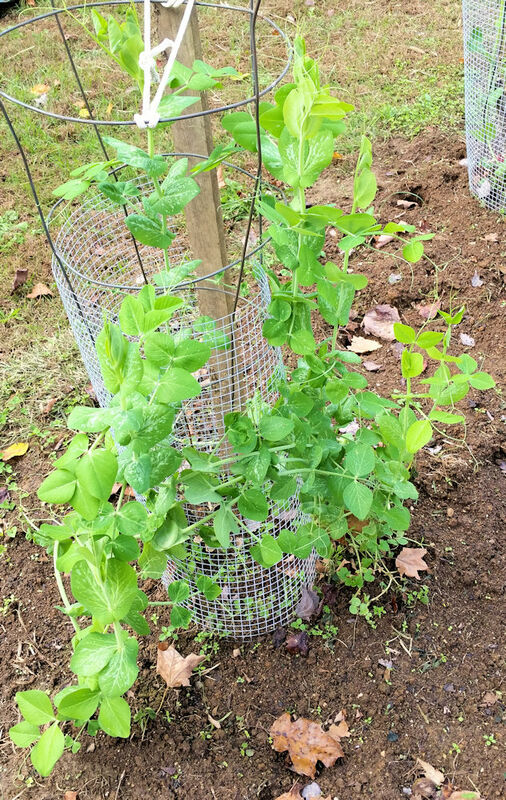 We’ve got fall peas growing but ….no blooms. And probably no pollinators if we did have blooms. The asparagus and garlic have been put to bed under straw. 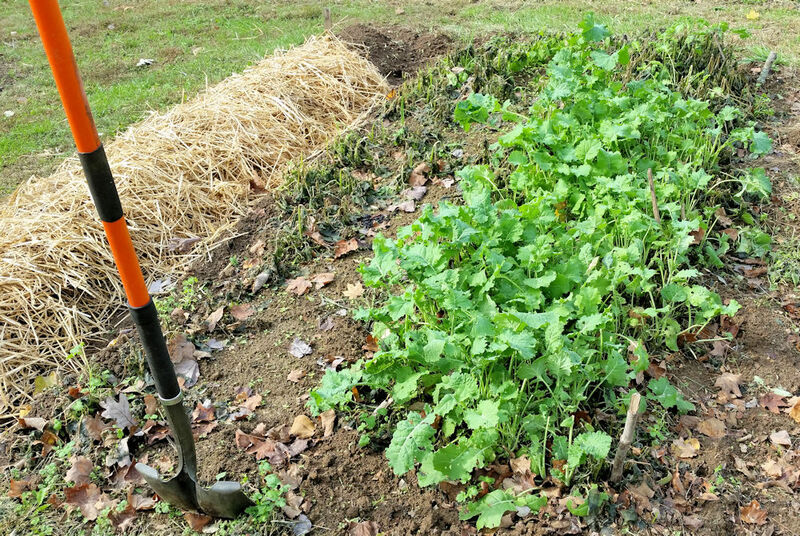 Garlic bed under the straw and some happy kale. See how well it survived the frost which killed the weeds. Fall peas look great but no blooms, and probably no pollinators. Note to self: plant earlier next year. 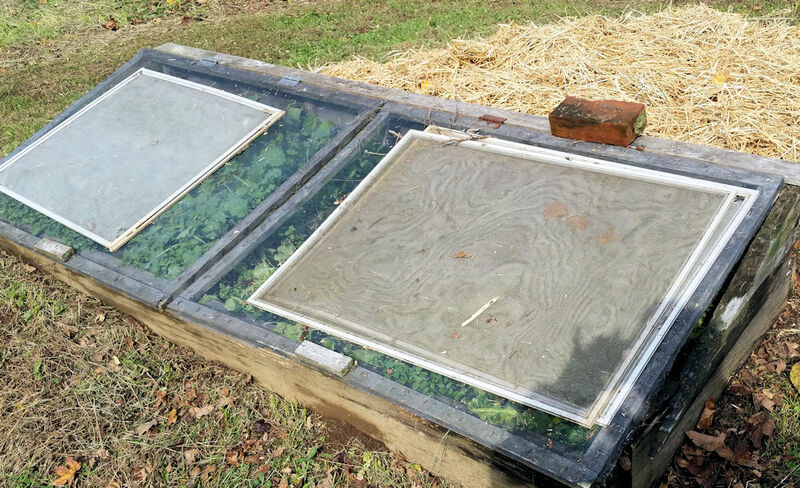 Cold frame with kale and lettuce. Asparagus bed behind under the straw. We will cover the cold frame as the weather gets colder. 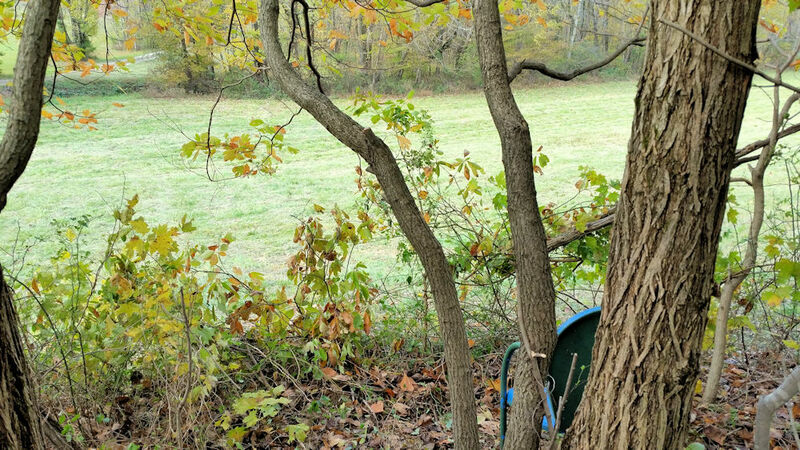 My husband has a deer blind in a small grove of locust trees overlooking the bottom field and creek where we often see deer. I’m not really worried that he’s going to get a deer as he’s only gotten ONE in thirty years. But….you never know. And the toll the deer population takes on cars in this area is steep. Our family alone has hit seven deer over the years. Deer blind overlooking the creek and lower field. Our wood pile is growing. Today the guys dragged several logs out of the woods as it’s easier to cut and split them all in one place, plus they handle the wood less than when they cut and split it in the woods. Thanks also to our son who came home for the weekend to help out. This is hard work! 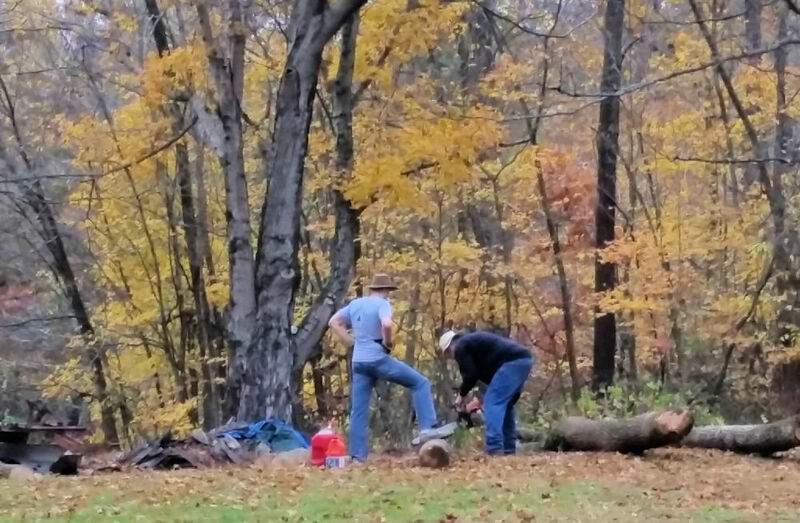 Cutting firewood on a Saturday morning in November. The walnuts have been picked up by the boy scouts who turned them in for money at the mill. What they missed, the squirrels are tucking away. 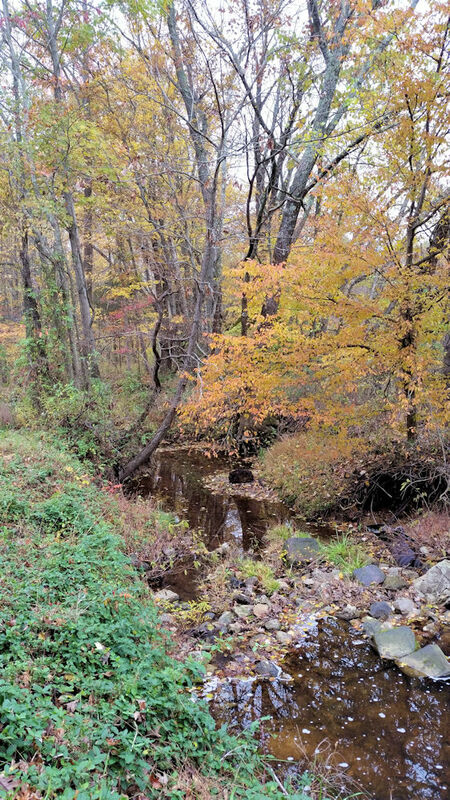 Fall at the creek. We have several creeks but pass this one every day as we go over it on the drive. 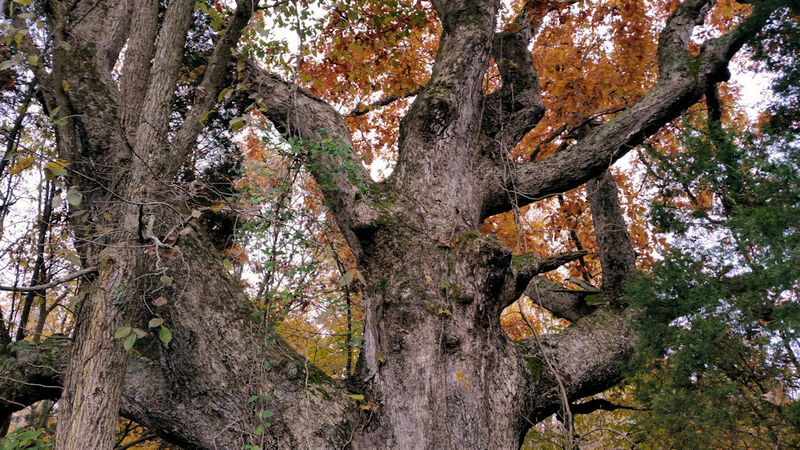 This giant oak tree has history and is one of my favorite trees on the property. I call it The Sentinel as it “guards” the driveway. And, it’s just a beautiful time to take a walk and enjoy the season while I can. I hope you enjoyed your visit to our country place. Feedback is always welcome. This entry was posted in country living, garden and tagged country living, deer, gardening, indiana, kit miracle, old house. Bookmark the permalink.